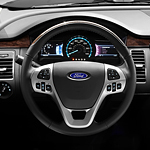 The new Ford Flex is a smart looking car for the smart auto consumer. This loaded vehicle features so many perks, it is difficult to highlight them all. A rear view back up camera, which is quickly becoming popular, is coupled with a Backup Assist Grid to aid in backing. The BLIS with cross-traffic alert rounds out the features protecting the driver form making errors due to blind spots. The Active Park Assist system removes the guesswork from parallel parking by utilizing sensors to help the driver know when to turn for a perfect curbside park every time. The Adaptive Cruise Control system comes with a collision warning system, as well. The Flex features a 3.5 liter EcoBoost V6 engine. It delivers a 356 horsepower rating and an impressive 350 pound foot of torque. Team this with the Intelligent All-Wheel Drive system, which balances out the torque between the front and rear wheels, and you have an excellent vehicle for a variety of road conditions. From wet, slippery to dry and clear, this vehicle can keep you on the road.